WE DIDN’T START THE FIRE. The Valley Heights Pep Band keeps it going at the basketball home games. Composed of the high school and junior high bands, there are many members under the direction of Kim Oatney. A lot of practice goes into making a spectacular performance for not only the crowd, but also the players. “I really enjoy the band playing when we come out to play. It gets me excited and focused to play the game,” says sophomore, Sam Vermetten. 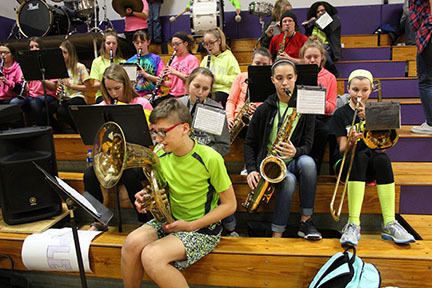 One difficulty in the system is that junior high and high school bands have separate hours dedicated to band, so they don’t get to practice together often. Megan Gray, junior, and clarinet player, says, “My favorite part about playing at games is that I get to interact with the junior high kids while teaching them and helping them, that means a lot.” Even though the two groups don’t get to practice together often, they still create a seamless “show” every home game.